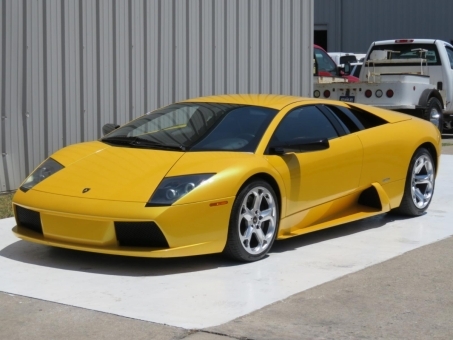 2004 LAMBORGHINI MURCIELAGO 3-OWNERS (CLEAN CARFAX) THIS CAR WAS TRADE IN BY PREVIOUS OWNER AT AUTHORIZED LAMBORGHINI DEALER FOR THE NEW AVENTADOR. ALL PARTS WERE PURCHASED FROM LAMBORGHINI OF WEST PALM BEACH AND ALL WORK WAS DONE BY EURO WOLRD WHO SPECIALIZES IN EXOTIC REPAIRS. CAR HAS A BRAND NEW E-GEAR CLUTCH THAT IS LESS THAN 500 MILES NICE TIRES, COLD A/C, SOUND, EXHAUST, XENON, 1 KEY WE SELL ALL UNITS WITH POSSIBLE PAINT WORK,CHIPS, NICKS & HICKS, THERE ARE SOME SCRATCHES ON THE BOTTOM OF BUMPER WHICH IS NOTHING MAJOR. WE WELCOME ALL 3RD PARTY INSPECTORS.